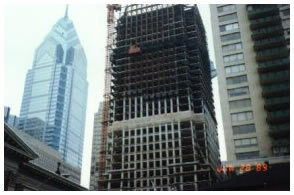 Custom steel column forms furnished by SCI for this 52 story Mellon Bank Headquarters Building, Philadelphia, USA. 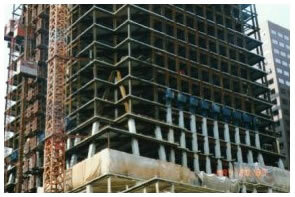 The steel columns were heavily reinforced and encased in concrete. SCI's forms were designed with hinged and sliding panels to eliminate the need for dismantling between each use. Column construction was critical to the overall production schedule as this project was designed as a composite structure. Work cages were included with the custom steel column forms, which allowed workers to safely access the exterior side of the column forms & steel structure. 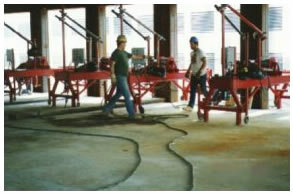 Remote controlled, electric Form Lifters were also designed and furnished by SCI. These Form Lifters were used to handle and lift the column forms from floor to floor, against the exterior facade of the structure. The Form Lifters had state of the art electrical controls, safety devices, and a telescoping boom that made it very easy to remove the forms at one floor and to reset the forms at the next floor. SCI designed & furnished these custom steel forms for the pedestrian walkways for this World Headquarters for The Hertz Corporation, New Jersey, USA. 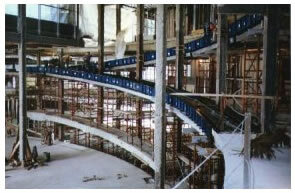 Many of SCI's standard formwork & falsework equipment and materials were incorporated into this system. The contractor was able to lay out all of the lobby walls, glass, railings, etc. from these steel forms, indicating the precise quality of fabrication that was used in the production of these forms.